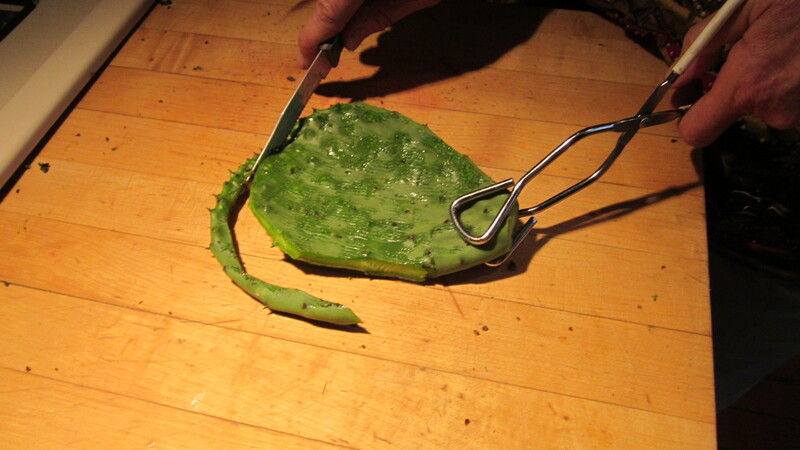 Nopales are ready when they are the size of your hand. It seemed like the nopales (prickly pear cactus stems) were late this year — or maybe I was just anxious for them to appear. The native species out on the desert began putting out new growth weeks ago, but the Ficus indica, the large Mexican variety didn’t have anything large enough to pick– at least in my yard — until about a week ago. Nopal stems are very healthy — full of all the sorts of vitamins you find in most vegetables with the added bonus of some gums and fibers that are helpful in regulating the blood glucose levels for people with non-insulin-dependent diabetes mellitus. The fiber helps, of course, but there is something else going on that researchers haven’t yet been able to figure out. 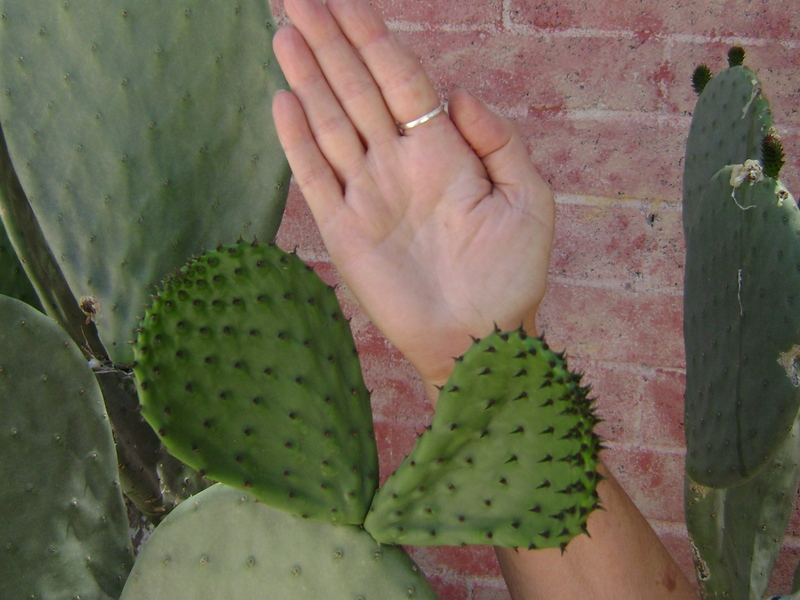 Prickly pear, both the pads and fruit, seems to increase sensitivity to insulin through some unexplained process. About 100 grams, around two medium-sized pads, before each meal will do the trick. That could be with eggs for breakfast, in a burrito for lunch and maybe with some other vegetables for dinner. Many people eat the pads fresh and sliced into a salad — that is one of the classic preparations. I prefer them cooked. They can be sauteed in a frying pan, grilled over coals or lightly coated with oil and baked. But first they need to be cleaned of whatever thorns are present. 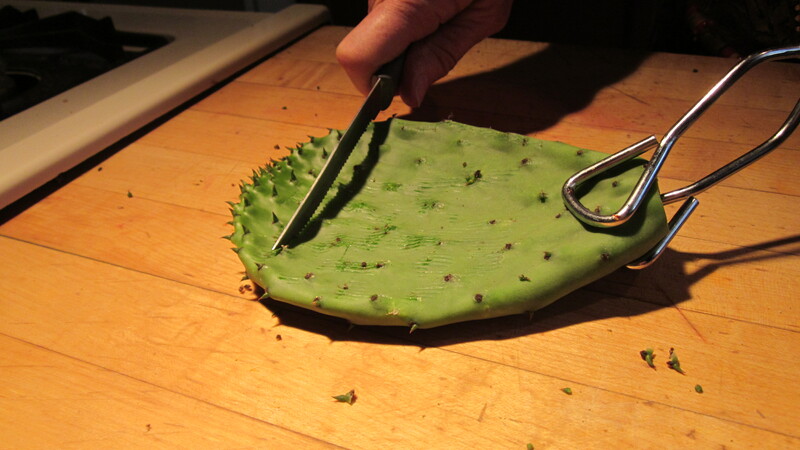 The photos below show how to remove the thorns with a common steak knife, going against the direction of growth. Put a little muscle into it. Then trim off the stem end which could be tough and trim off the edge. 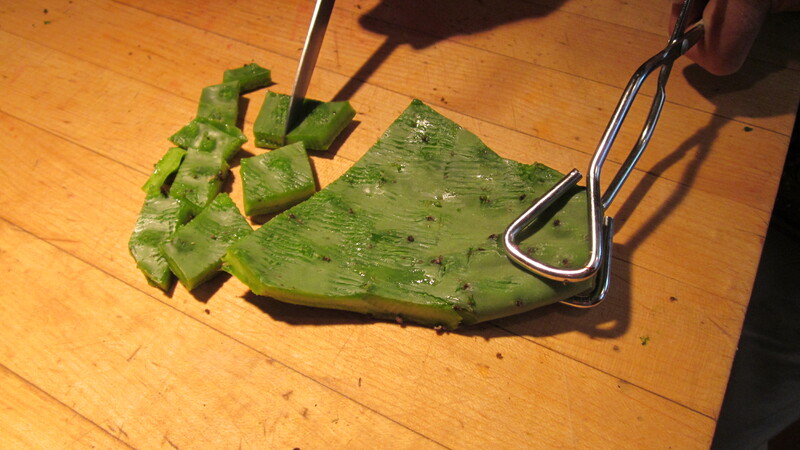 Once you chop it into small pieces you have nopalitos. 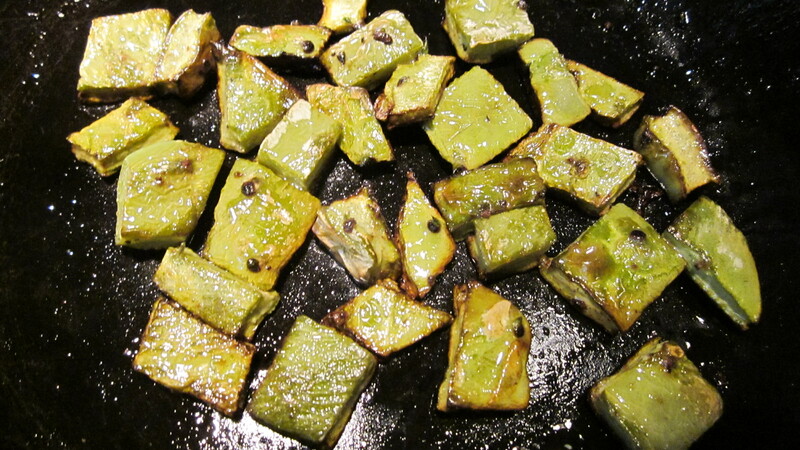 As you cook the nopalitos, they will shrink as they lose water. This reduces the gummy texture. They all change color from bright green to olive. Sizzling noplalitos ready to eat. Now you have nopalitos that you can combine with other ingredients into delicious recipes. You can stir them into commercial or homemade salsa, scramble with eggs, or include with roast chicken to roll into a burrito. You can find delicious recipes for Nopalitos and Chicken in Culichi Sauce, and other simple-to-prepare gourmet dishes in my latest cookbook Cooking the Wild Southwest. There are also both classic and innovative recipes in The Prickly Pear Cookbook. How do Grilled Chicken with Noplito and Pineapple Salsa or Jicama and Nopalito Salad sound? Yum! 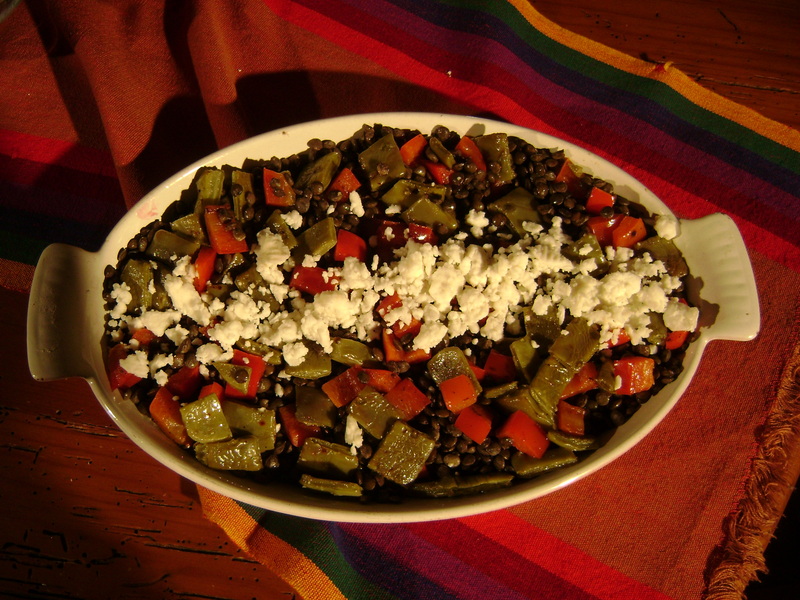 Below is a photo of French Green Lentil Salad with Nopalitos from Cooking the Wild Southwest. If you have a favorite preparation using nopalitos, please share it here with me and the other readers. Nopalitos are mild tasting and there are endless ideas for including them in dishes. What is the best nopalito dish you ever ate?